You are here: Home / Daily Journal / February 15: Jamming!!! Happy Hump Day! I think I’m empathizing too much with all of you couples out there. I woke up with a horrendous headache, actually feeling like I was hungover from too much wine during a Valentines dinner. So far from the truth, I know. I was moving so slowly today until I popped some Advil. Today was my 1/2 work day, from home… I got so much done, it was a great day. Twin Husky was playing with a balloon, throwing it up, and watching it fall down, and throwing it up, and watching it fall down, over and over…. The rest of the morning was standard, I think. 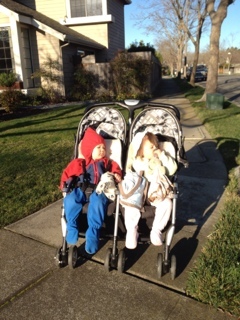 Breakfast, changes, getting ready….I was going with Big Bro along with the stroller and Twins so had to move quickly to get myself together. It was cold outside. Twin Crazy and Twin Husky were bundled up. They enjoy the stroller rides. Big Bro rode as part of the Motley Crew and I even saw him try to grab pole position a few times off of the stopping points along the way. Go Big Bro! He’s feeling brave and gaining confidence. I was set up to volunteer at Big Bro’s lunch today, but he asked me not to come. In fact, he kept asking me not to come. He’s not good with large crowds. It’s OK if I volunteer inside of his classroom, but in the big cafeteria is too much for him. So I was disappointed, but decided to honor his request. I’m set up for next week too so I’ll try again then. I dropped the Twins at their daycare, and gave them big hugs and kisses goodbye. My walk home was fast and brisk. It is damn cold outside. The sun is out and I’m feeling good about what I need to do today for work. I get home, refill my coffee, eat a bagel, straighten up the kitchen, load the dishwasher, and throw in a load of laundry. I set up my computer, and get my phones nearby. OK. I’m ready to work. I had a sales meeting with our internal team. I sent out invitations to both of our forums for the special meeting we will be having in April to potentially launch a new forum. I’m excited to see the response I get back. I set up some meetings with my team on Friday to get them to complete some deliverables in advance of our client meeting on Tuesday. I started to think through some consumer research that we will need to develop for one of the meetings in April. We have time to execute on both but I need to gather the previous survey questions and analysis so I can build something with trending data over time. I found help to gather the materials and set up a meeting with a partner of the firm’s for Friday to map out a go-forward plan for the research. I touched base with a colleague in London for some work that I will help him with – it involves some market interviews that I will need to set up, perform, and document. I think I’ll have the time to help him. I started some sales outreach to get some more “guest” organizations to one of our forums in April. This is a way to sell memberships with new clients – invite them as guests, and have them see the value of the meetings and membership. I need to start the outreach which will become easier once I get the agenda put in place. I reached out to some potential speakers for the events in April. I will have a lot more of this to do between now and then. I went to pick up Big Bro at 3:30. 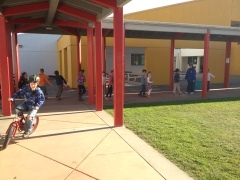 He had fun riding his bike in front of the kids at his aftercare program. It is so strange to see your own child in those “peer pressure” kinds of moments… I feel like my own childhood was not that long ago… and I can see myself in him; I can easily imagine how he must feel to be riding his bike around his school, riding his bike to one section of the school, and just by chance seeing his aftercare class going to the playground although it was likely on purpose…. and riding in front of the kids, with all of the kids calling his name…. and he was riding around smiling and laughing and riding his bike in front of his friends. I wanted to take more pictures but I didn’t want to embarrass him. Together we picked up Red, and we just happened to interrupt a science experiment where they were making “clean mud” out of soap shavings, water, and pieces of toilet paper. 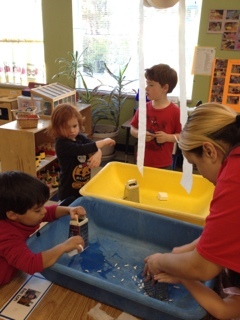 It was cute to see Red involved in her science experiment and I thought to myself how happy I am that she is in this type of learning environment. I just wish it didn’t cost so much! Now I feel guilty for Twin Crazy and Twin Husky. 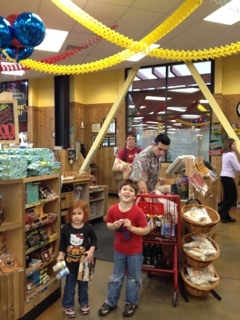 Off we went to Trader Joe’s for food for tonight, oatmeal in bulk, and snacks that we are running low on. I can’t believe how much food we go through. I can’t imagine what feeding 4 teenagers will be like in 12 years time…. We then picked up Twin Crazy and Twin Husky. 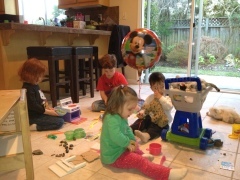 While at home I had them set up with play dough as I cooked dinner. I sat with them as they played play dough as I folded clothes. And then I just sat and played with them. After dinner came and went quickly. Bedtime was rough for Twin Crazy since we lost one of her sleep blankets. Hopefully it is at daycare. Big Bro is sleeping on my floor again tonight. He was complaining all night that his mouth hurt, and I’m wondering if his teeth may be coming in… he fell asleep so quickly and is deep in sleep now… it makes me feel good to know that he is getting extra sleep. It was a really good day. I feel like I was able to be there for the kids and also had a very, very productive day at work. I really think that working several hours while at home is the ultimate of both worlds. I was able to cook for my family, get the house straightened up a bit, get some laundry done, but still be there for the kids. In the morning. In the afternoon. And I was so busy during the day for work. It honestly is working so well – I have something I need to send out that I forgot about (and will do that next) but tomorrow will be a free day for me. I am loving this.